Looking at my sidebar & inspiration counts – Reese Witherspoon and Lauren Conrad are my two most frequent celebrities that I use for inspiration photos. I like how both women’s style include clothes that are colorful, easy and wearable. And this outfit Reese is wearing is no exception. I love the combination of fun bright blue blouse, simple white shorts, easy sandals and a bit of gold sparkle in the necklace. Easy peasy and I’m out the door! 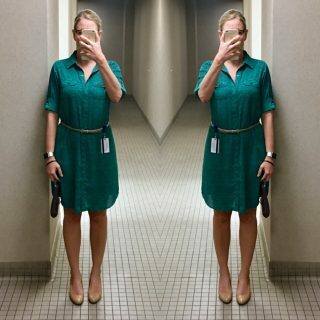 Interesting article Capitol Hill Style linked to in the Washington Post about evolution of newswomen’s professional attire over the past few years. Love RW's style, and I'm loving the necklace too. Great easy outfit for the weekend. Reese and Lauren are 2 fabulous style icons. I love their simple but polished looks. Cute idea! I wish I'd gotten a second shirt in another color bc this one is great. Smart of you to buy a backup! For teenage girls, hormones released during puberty may lead to fat storage around the breasts, hips and abdomen, which can cause self-consciousness and a tendency to hide behind baggy clothes.